Artech Avantika – a private Eden set in the midst of the quiet charm of Vellayambalam, provides a modern, contemporary and luxurious lifestyle nestled in the warm embrace of nature’s many delights. Located at Udarashiromani Road on the Vellayambalam – Vazhuthacaud stretch in Trivandrum, Artech Avantika brings to you 2 and 3 BHK apartments designed to let in an abundance of natural light. The project is equipped with multiple leisure amenities like a Fully Air-Conditioned Unisex Gym, Badminton Court, Toddlers park, Guest Suites, Amphitheatre, Rooftop Party Area, etc. 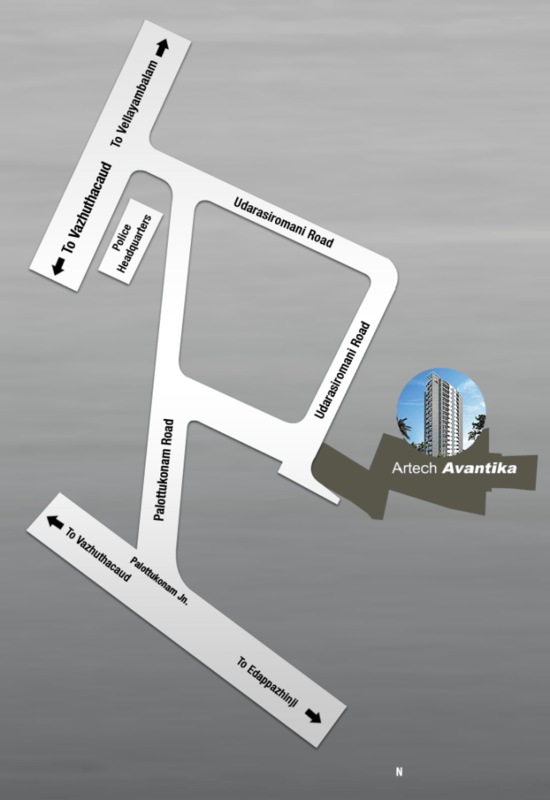 Artech Avantika is located at Udarashiromani Road on the Vellayambalam – Vazhuthacaud stretch in Trivandrum. It can also be accessed via Palottukonam road on Vazhuthacaud – Edapazhinji stretch.The location is well packed with all the facilities within easy reach and is therefore the perfect location for the residential abode. Trivandrum central railway station and International airport are in close proximity to the location, only 3 km & 9 km respectively. A grand entrance lobby, stately corridors & elevators, multiple leisure amenities, and an overall plush campus…these are only a few of the wonders that awaits you at Artech Avantika. Inside your private living space, an air of sophistication surrounds you. The living, dining and bedrooms are specially designed to let in an abundance of natural light, creating a sprightly, effervescent and spacious living sanctuary. Neither expense nor attention has been spared to ensure that the interiors are furnished with elegant designer fittings. These exquisite details put the finishing touches on your perfect home. With spacious planning in 2 & 3 BHK variants ranging from 1150 – 1850 Sq.ft. to choose from, you are certain to find a perfect space suiting your needs at Artech Avantika to call your own. Foyer/ Living/ Dining – Premium quality vitrified tiles of size 80 x 80 cm. Master Bedroom laminate wooden flooring. Master Bathroom and other Toilets – Designer ceramic tile concept of size 30 x 30 cm for floor and 30 x 60 cm for walls up to 7’0″. Kitchen – 60 x 60 cm vitrified tile and 30 x 45 cm for walls up to 4’6″ height or 2′ above the counter if any. Balconies/ Open Terraces/ Decks – Rustic/ Antiskid/ Ceramic tiles of size 30 x 30 cm. Superior quality granite for counter top. Grohe or equivalent brand diverters for master toilet. All internal door frames shall be of hardwood with flush door shutters. Powder coated aluminium heavy duty four track sliding window with mosquito net, MS grill and glazed sliding door for balconies. c-metro equivalent modular type switches, adequate light and fan points. Provision for geyser connection in all attached toilets. Provision for telephone in living room and all bed rooms. High speed passenger and stretcher lift – Kone or equivalent. Access control entry to the common entrance, foyer and gymnasium. Boom barriers at entry/ exit of the complex. Artech Avantika empowers you with all the lifestyle needs right at home, the sprawling landscape and the plush environs whistle inviting welcomes every time you come home. Engaging you with facilities from a gymnasium to Indoor games, whether fulfilling individual pursuit or bridging relationships with your loved ones, every wish is easily transformed into reality. Work status as on ​16-04-2018, we have completed the following. ​Work status as on ​10-03-2018, we have completed the following. Work status as on 10-​​02-2018, we have completed. Lift wall steel work – completed. Following works are expected to be completed by end of June 2015. As on 6-3-2015, we are progressing 3rd floor -Slab shuttering & Steel works. The 3rd & 4th floor slab RCC works are expected to be completed by next month. Everyone reaches a point in their life when paying rent just doesn’t make sense and you want to buy your own home. If you have reached that stage, then look for flats in Vellayambalam as this area is one of the best places to live in, with its wide roads, good infrastructure, lots of trees and lower pollution. It’s unbelievable that such a place actually exists in the heart of the city and provides peaceful addresses for residential homes. Vellayambalam Junction is uniquely placed too as it is located on the Rajapatha (royal path) that exists between Kowdiar and East Fort. The junction hosts a statue of Ayyankali, the freedom fighter and serves as a memorial for him. The junction also connects major locations like Kowdiar, Sasthamangalam, Thycaud and Thampanoor. The area is home to a good number of government offices and parastatals, good schools as well as entertainment venues like Kanakakunnu Palace, the museum and zoo complex, movie halls, etc. Buying apartments in Vellayambalam would also mean being able to access all these places in a jiffy while being able to live in the serenest of locations. Aside from the location of the apartment, the builder also matters a lot. After all, nobody wants to invest large sums of money with fly-by-night operators who can easily swindle you. Go with big brands that have loads of experience to back them, like Artech Realtors. They have a number of apartments in Vellayambalam that you can look into.